Hincher, James A., head-of-household, age 36?, born in North Carolina; parents born in North Carolina; occupation: farmer, general farm. Hincher, Rachel O., wife, age 30?, born in North Carolina; parents born in North Carolina. Hincher, Oma E., daughter, age 13?, born in North Carolina; parents born in North Carolina. Hincher, Minnie V., daughter, age 5?, born in North Carolina; parents born in North Carolina. Hincher, Sam W., son, age 3 years ? months, born in North Carolina; parents born in North Carolina. Hincher, Ambrose M., son, age 1 year ? months, born in North Carolina; parents born in North Carolina. Living next door in 1920 was the family of James' widowed father15 and his siblings. 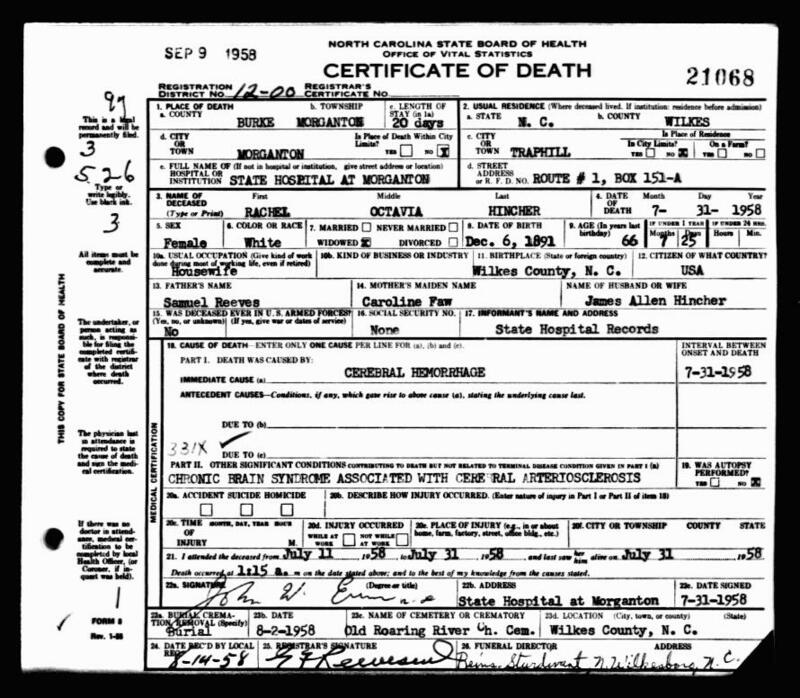 Hincher, James A., head-of-household, age 46, born in North Carolina; parents born in North Carolina; first married at age 27; owned home; no radio in home; occupation: farmer, general farm. Hincher, Octavia, wife, age 38, born in North Carolina; parents born in North Carolina; first married at age 19. Hincher, Minni, daughter, age 16, born in North Carolina; parents born in North Carolina. Hincher, Sam T., son, age 14, born in North Carolina; parents born in North Carolina; attended school. Hincher, Ambrose, son, age 11, born in North Carolina; parents born in North Carolina; attended school. Hincher, Osco, son, age 8, born in North Carolina; parents born in North Carolina; attended school. Hincher, Albert J., son, age 5, born in North Carolina; parents born in North Carolina. Hincher, John A., son, age 5, born in North Carolina; parents born in North Carolina. Hincher, Vilene R., daughter, age 2, born in North Carolina; parents born in North Carolina. 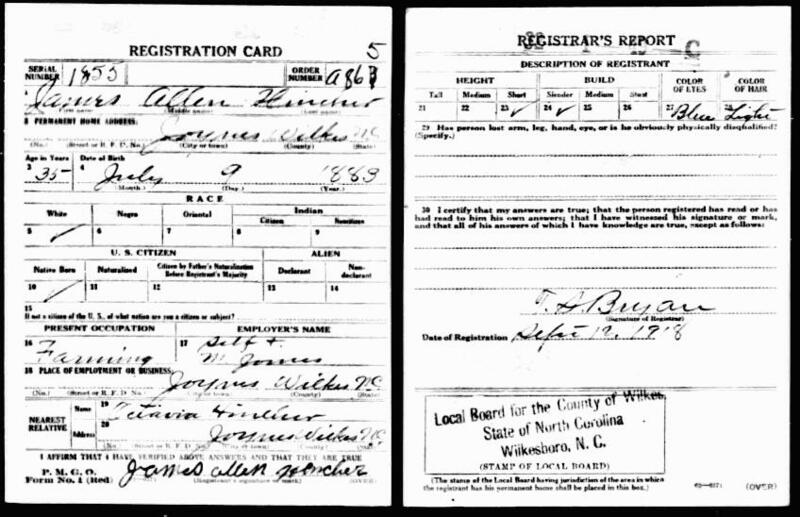 Hincher, James A, head-of-household, age 57, born in North Carolina; completed 4th grade; on Apr 1 1935 was living in the same house; owned farm ($200 value); occupation: laborer, [..unclear..]; worked 48 weeks in 1939; $360 wages in 1939. Hincher, Octivia R., wife, age 49, born in North Carolina; completed 4th grade; on Apr 1 1935 was living in the same house. Hincher, L. Osca, son, age 18, born in North Carolina; completed 4th grade; on Apr 1 1935 was living in the same house; occupation: laborer, farm. Hincher, John A, son, age 15, born in North Carolina; completed 5th grade; on Apr 1 1935 was living in the same house; occupation: laborer, farm. Hincher, James A, son, age 15, born in North Carolina; completed 8th grade; on Apr 1 1935 was living in the same house; attended school. Hincher, Violean R, daughter, age 12, born in North Carolina; parents born in North Carolina; completed 6th grade; on Apr 1 1935 was living in the same house; attended school. Hincher, Izzie M, daughter, age 9, born in North Carolina; completed 4th grade; on Apr 1 1935 was living in the same house; attended school. Obituary of Ambrose Milton Hincher. 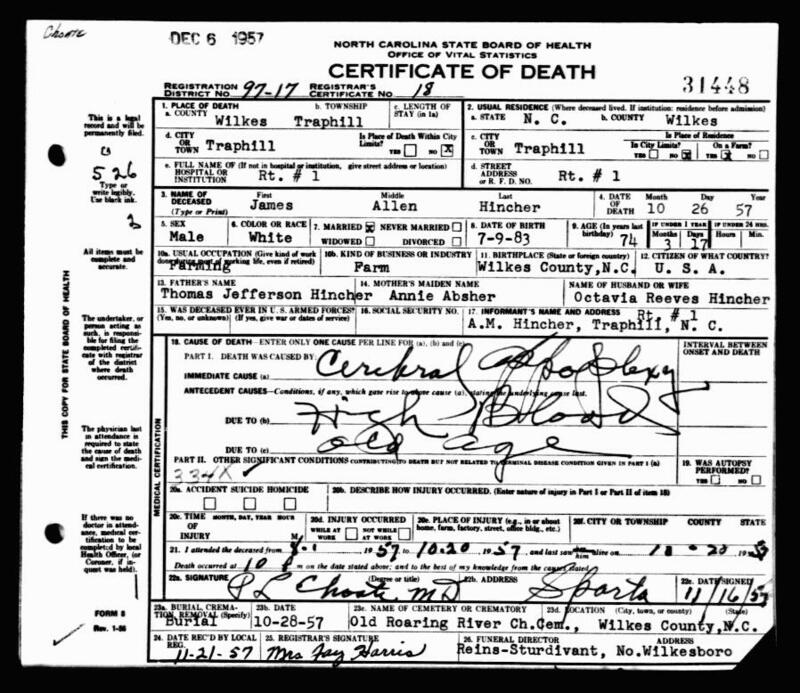 1900 census, Traphill Township, Wilkes County, North Carolina; roll T623-1224, ED 158, page 11B, line #69, dwelling #217, family #220. 1920 census, Trap Hill Township, Wilkes County, North Carolina; roll T625-1329, ED 186, page 1B, line #90, dwelling #23, family #23. 1920 census, Trap Hill Township, Wilkes County, North Carolina; roll T625-1329, ED 186, page 1B, line #96, dwelling #24, family #24.